Quattro Stagioni canning jars and lids are becoming almost as widely available as the more familiar Ball Mason and Kerr jars. Although different in jar shape, lid type, and canning process, these jars and lids are easy to use and do perform well. 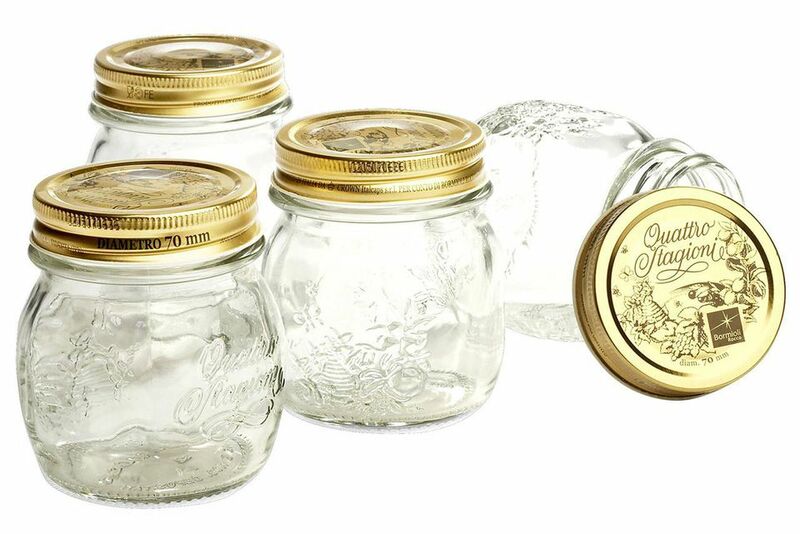 Quattro Stagioni canning jars come in 250 ml/8.5 oz, 500 ml/17 oz, 1 liter/34 oz and 1.5 liter/1.6 quart sizes. The fact that the sizes are in the metric system may slightly throw off the amounts needed to fill the jars if you are using a recipe with measurements in the imperial/U.S. system. But this problem is negligible. The rounded shape of the jars is attractive, arguably more interesting than the straight sides of wide-mouth Ball and Kerr jars. One downside with the small 250 ml/8.5 oz jars is that although the 500 ml/17 oz jars can be used with the regular size of 2-piece Ball and Kerr canning lids, the small size Quattro Stagioni jars can only be used with the small size Quattro Stagioni lids. The lids of Quattro Stagioni canning jars are a single piece. Like the inner disks of 2-piece canning lids, these should not be reused for canning because the adhesive ring that enables a tight vacuum seal loses strength with reuse. However, they are fine to reuse for recipes that will not be canned such as lacto-fermented pickles. One advantage of the Quattro lids is that they are easier to open (even once safely sealed) than 2-piece canning lids. Have you ever given someone completely unfamiliar with home canning the gift of a jar of preserves only to watch them be baffled about how to open it? Quattro's lids pop the vacuum seal with a simple twist action just like store-bought jars of preserved food. Note that the processing method with Italian Quattro Stagioni lids is a bit different than with standard 2-piece canning lids. With the latter, you remove the jars from the hot water of the canner as soon as possible after their processing time is done. With the Quattro lids, you leave the jars to cool inside the canner as the water cools. This is a slight disadvantage if your kitchen and stovetop space is limited. An enormous advantage of the Italian Quattro Stagioni lids is that they are BPA-free. Unfortunately, Ball Mason and Kerr 2-piece canning lids do include BPA-leaching plastic coatings (if you aren't familiar, BPA is a substance leached by some plastics that is a major health hazard). Tattler Reusable Canning Lids can be used with all but the smallest size of Quattro jars. Italian Quattro Stagioni canning jars and lids are pricier than their counterparts. For example, a 17-ounce Quattro jar costs about $3.00, compared to about $0.99 for a Ball Mason jar of comparable size. The BPA-free factor of the lids plus the attractive shape of the jars makes Italian Quattro Stagioni jars and lids worth the extra price. I Love Jams Made with Chia. Can They Be Canned? Why Can't I Can Pumpkin Butter at Home?